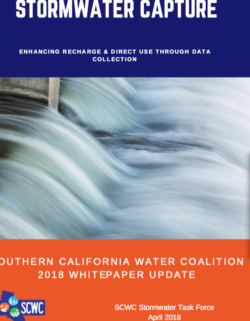 The purpose of this 2018 white paper update is to gain a better understanding of actual stormwater runoff capture volumes, costs, benefits, and project performance across the region to inform future discussions. This white paper augments prior efforts and uses the most recent and best available stormwater project data. Previously in January 2012, the SCWC published its first white paper on stormwater titled Stormwater Capture: Opportunities to Increase Water Supplies in Southern California (SCWC 2012). The purpose of the 2012 white paper was to examine existing statewide policies, goals, and regional plans related to integrated stormwater management; trends, structure, and requirements of MS4 permits as they pertain to both opportunities and constraints to maximizing stormwater capture for water supply purposes; and the advantages and disadvantages of two strategies of stormwater management: onsite low impact development and regional stormwater capture and infiltration. Lastly, the 2012 white paper largely focused on conceptual stormwater projects and technical strategies for increasing stormwater capture. Since the 2012 white paper, many of the proposed projects were constructed and in operation. Other plans such as Metropolitan’s 2015 Integrated Resources Plan (MWD 2016), the City of Los Angeles’s Stormwater Capture Master Plan (LADWP 2015), and Los Angeles County Flood Control District’s LA Basin Study (LACFCD 2016) also estimated stormwater capture and costs. The SCWC saw an opportunity to evaluate the costs and benefits of these constructed stormwater capture projects and pursued a white paper update.